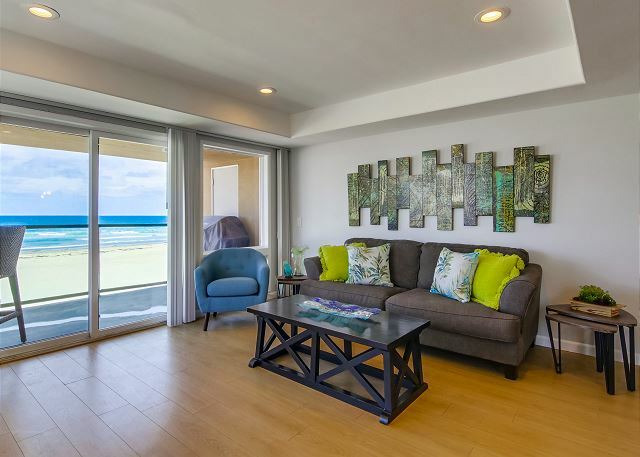 This recently remodeled ocean front condo provides clean and spacious accommodations for your family vacation. 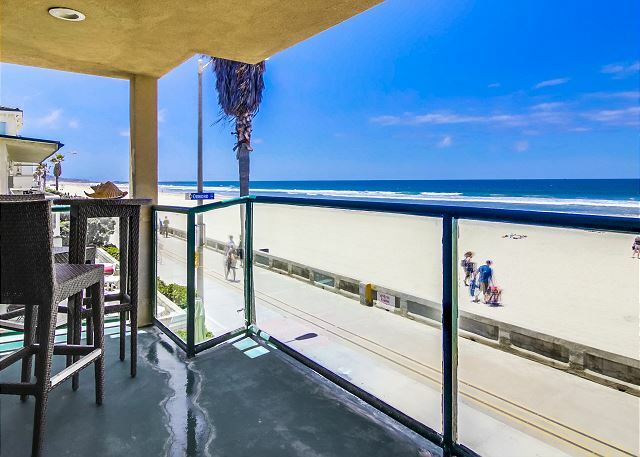 You have wide open ocean views from the second floor, perfect for watching all the activity on the beach and boardwalk without having people passing directly in front of you. 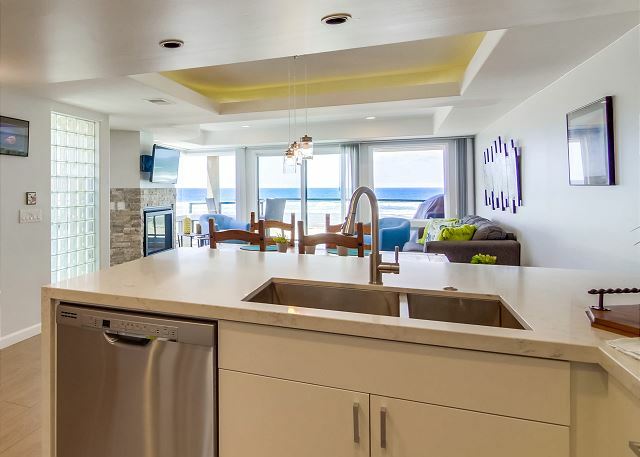 The private balcony is equipped with a propane BBQ grill so you can watch the family play in the waves while preparing meals. 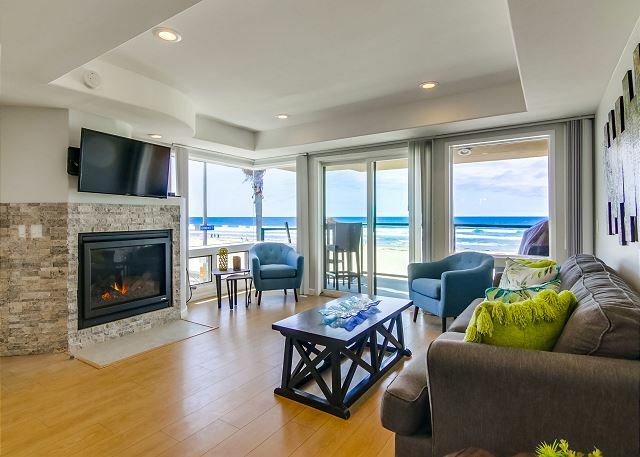 The living room is a cozy area with expansive ocean views, flat screen cable TV, and a gas fire place. 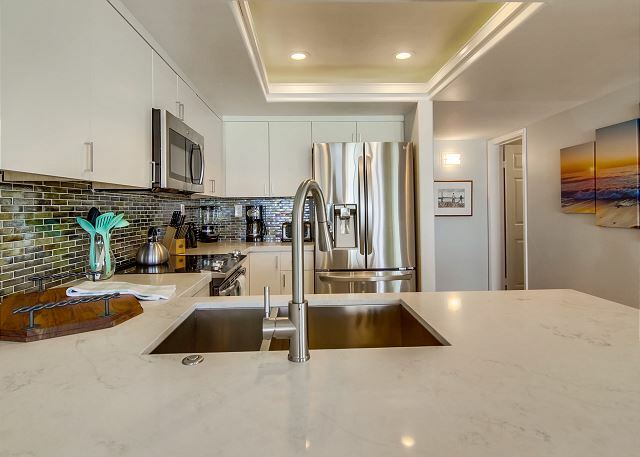 The kitchen is modern with upgraded stainless appliances, marble counter tops, drip coffee maker, and a blender. There are three seats at the counter so you can easily spend time with friends and family. 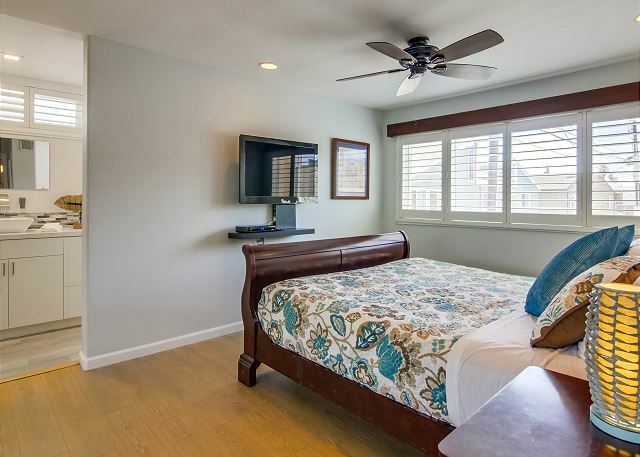 The master suite is a peaceful ocean side retreat. 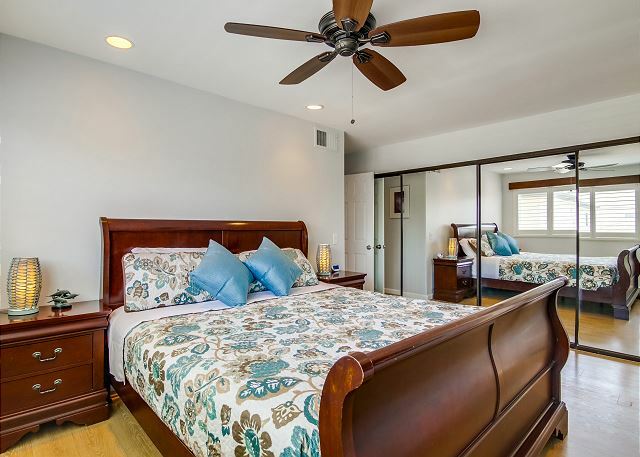 Relax in this spacious room with a King bed, flat screen TV, ceiling fan and en suite bathroom. The master bathroom has fabulous features and a perfect layout. 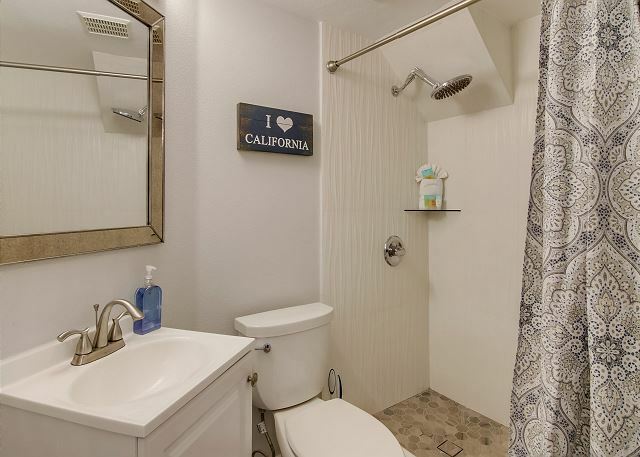 Enjoy the convenience of a dual sink vanity while getting ready and a luxurious walk in shower with three shower heads.The soaking tub is perfect for relaxing after a long day of playing in the sun. The soft lighting in this area further accents the peaceful blue and grey tile work. The guest bedroom has a Full under a Twin bunk and a pull-out Twin Trundle. For the children's entertainment this room has a TV with cable. The guest bath has also been remodeled with a freshly tiled walk-in shower. Parking Can be difficult in the Mission Beach Area. 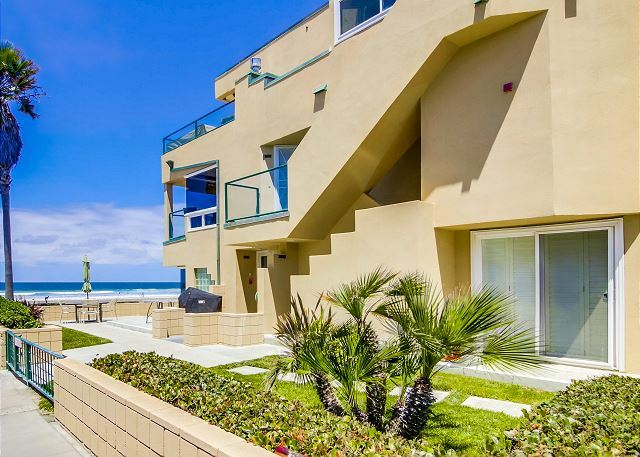 This condo has designated parking within a shared four car garage. Please park on the left side of the garage only, the right side is designated for a different condo. The dimensions of the designated parking space is approximately 6'8" High X 8' Wide X 31' 3" Deep. 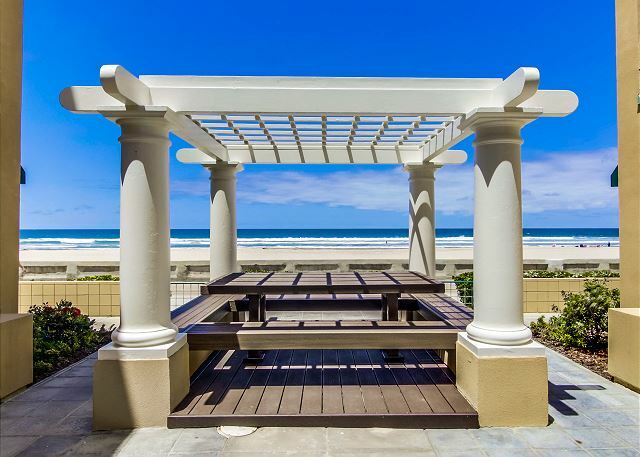 Interested in owning your own San Diego Vacation Rental? Please contact us for more information. Entertainment TV in 2nd. Bdrm., TV in Living Room, TV in Master Brm. 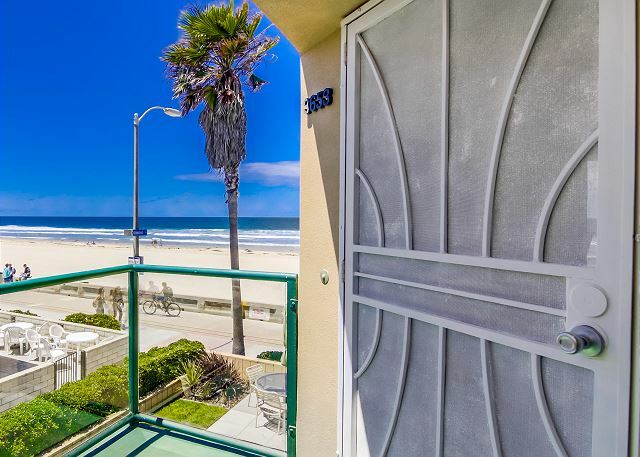 Private oceanfront view and updated! Great Right on beach! View was the best! Updated and bright! Furniture comfy and master bath was exceptional! Enjoyed the soaking tub with the dimmed lights! Will stay again and bring the grandbabies! 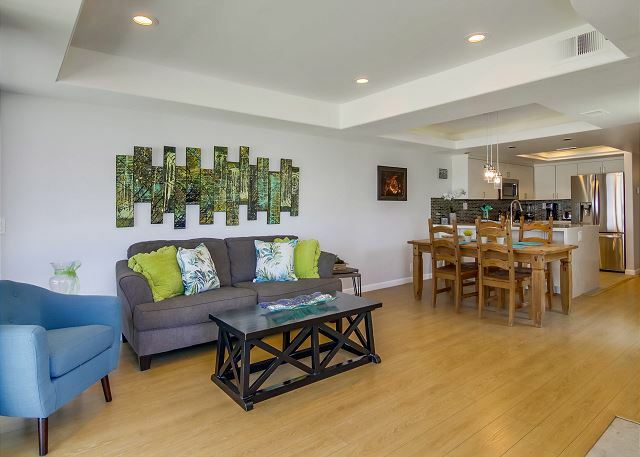 2 car garage was a bonus for Mission beach with room for chairs and toys! Thank you for the wonderful review. We are glad you enjoyed your stay and hope you will stay with us again the next time you visit San Diego. Great location and having an updated place to stay was great. Master bath shower was the favorite of the family. Very convienent to have a parking spot in a garage as well dedicated. Would stay in this place again next trip. handsoap in the kitchen or toiletries in the master bath. In the unit there were a couple of boo-boos that could be fixed (leaky hose bib on deck; screen door; vertical blinds covering sliding door should be reversed so they don't bang together in the breeze) but this didn't interfere with our having a very nice stay. The master bath was divine - beautiful sinks and faucets and a dreamy walk-in shower with multiple fixtures and an illuminated soaking tub. We enjoyed sitting on the balcony every morning and afternoon and were surprised how quiet it was at night and in the unit in general, even though there was lots of activity around during our stay. Very tight parking in garage for our small SUV, but glad to have the space. We look forward to coming back as soon as we can! Thanks!